Apparently, the creator of the instrument was Alan Andrews. He was born in the family of a broker (owner of a brokerage office), and literally from the very childhood absorbed the basics of exchange work and trade in the markets. Then, having received an education at the Massachusetts Institute of Technology, Andrews also conducts the affairs of his father. By the end of the 1920s, Andrews was able to earn his first capital - a million dollars. For a long time, Alan Andrews kept secret his strategy and trading system, which worked efficiently and brought him success. He began to disclose cards when he began to conduct stock exchange business seminars. This happened in the 1960s. In his methods, the trader actively used various updated and modernized methods of analysis (Roger Babson's analysis methods). They also provided an opportunity for Andrews to predict the collapse of the stock market in 1929. Consider the details of Andrews' pitchfork, or more precisely how they should be used in trading. 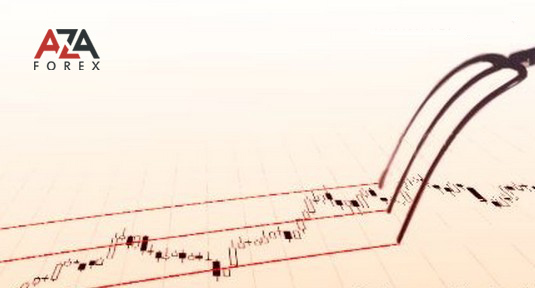 Andrews' pitchfork is used to build the main price channel on the trend market, and also to divide it into two parts. The lines that are created on the basis of pitchforks demonstrate nothing less than support and resistance, showing the degree of probability that the price will depart from the line and go beyond the price corridor. 2) from the chosen point we draw a line that goes to the next significant point (turning points, for example point B). 3) the construction of the third line comes from a significant point, which was formed earlier (for example, point C). On the basis of this line will be divided into two halves: the distance between A and B is divided into two equal segments. The straight line that was drawn from point A will be the midline, and the straight lines from points B and C will act as the fork teeth. As for the Andrews pitchfork, the trade in the price channel is very similar to the trailing, which is based on the application of pitchfork. The prongs will act as the leading channel, the exit from it can lead to a price reversal, or the strengthening of the trend. From the parameter, such as the strength of the channel, the importance of its breakthrough depends. The middle line helps to understand if there is a slowdown in the trend or whether there is a likelihood of a reversal. A favorable place to add to the position will be nothing more than reversals on this straight line, which are oriented towards the leading trend. In the event that the middle line breaks in the direction opposite to the trend, you either need to exit the transaction, or fix a part of the income. To build forks as accurately as possible, it is better to use rather large timeframes. Typically, a tool like Andrews' pitchfork is used in conjunction with other forex analysis tools. According to Alan Andrews, it is necessary to conduct an in-depth price analysis and calculate the waves, and also apply some rules and methods in order to calculate the probabilities. For example, developed on the basis of forks, the indicator of the pitchfork Andrews helps the trader in work. Using this indicator, you can create shapes for analytics, on specially selected time periods.